The market seems to have decided direction. The market will go its own way. Gold: Gold prices plummeted. XAUUSD confirmed that $ 1307 is a strong resistance line. My prediction was right. Gold prices will drop to at least $ 1269.5. In the medium term, they will fall to $ 1250 or below. The silver prices are fluctuating. XAGUSD collapsed. I expected $ 15.37 to be a strong resistance line. As expected, the silver did not overcome that line. This means $ 14.95 is supportive, but weak. XAGUSD will drop to at least $ 14.68. In the medium term, silver prices are likely to drop to $ 13.9. I will hold the sell-positions. WTI: There is no change in the crude oil market. Crude oil prices have stopped rising but will rise again. They hit very strong resistance lines. However, the oil market has no other options. There is only a way to rise. Brent oil will rise to at least $ 75.3 and WTI to at least $ 68. Euro: The euro market is not good. We have to wait until the Euro starts moving. ERUUSD is confined between 1.1173 and 1.133. 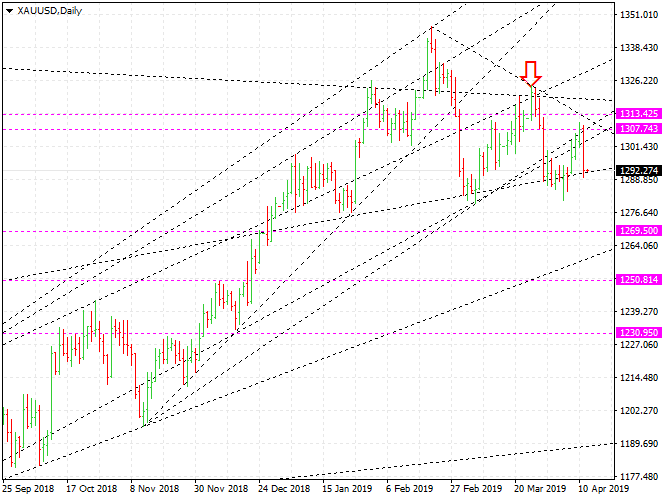 EURUSD is in a downward trend.